Aloe chlorantha is a medium-sized aloe from Fraserburg in the Karoo, at once distinguished by its erect solitary inflorescence, up to 1,6 m high, with small greenish yellow flowers. Plants solitary or sometimes dividing to form small groups, with a short erect stem up to 100 cm tall and covered with a skirt of dry leaves. Leaves in a dense apical rosette up to 400 x 80 mm, ascending-spreading, lanceolate-attenuate, the apices often slightly incurved, the surface dull green, to purplish green, faintly spotted on the lower surface; margin dentate, armed with reddish-brown triangular teeth. Inflorescence erect solitary, up to 160 cm tall, bearing large fleshy bracts, and the raceme (the flower-bearing portion) 35-60 cm long. Flowers (perianth) small, with distinctive greenish yellow colour, up to 12 mm long, laxly arranged in an ascending or horizontal position when mature. Fruiting capsule 17 mm long. Seed 4,5 x 2 mm. 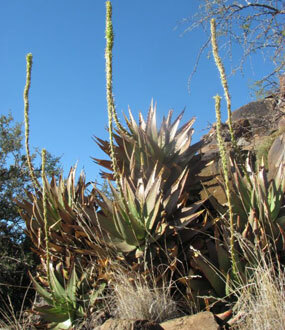 Aloe chlorantha, although not often encountered and with a limited distribution, occurs in remote parts of the Karoo. The populations are healthy without any threats. However, it is classified as Vulnerable (VUD2) in the Red List of South African plants (Victor 2009). Confined to the Fraserburg District of the Northern Cape. 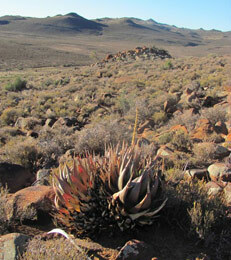 Plants grow in Roggeveld Karoo on dolorite outcrops situated on the inland escarpment. Its habitat is rocky hills and small mountains growing in an open sunny terrain. It is nowhere common and occurs scattered in groups. Associated species include various shrubs and succulents such as Bulbine abyssinica, bushman candle (Sarcocaulon salmoniflorum), star-euphorbia (Euphorbia stellispina), Euphorbia hypogaea and Crassula nudicaulis. Rainfall occurs mainly during winter (cyclonic cold fronts) and summer (thundershowers), and ranges from 150-200 mm per annum. 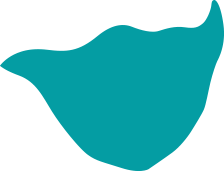 Summers are hot and the daily average temperature is about 27ºC. Average winter temperature is 10,6ºC with heavy frost. The specific epithet 'chlorantha', chloros =green, 'anthus' flower, pertains to its unique green flowers. The plant was first brought to the attention of Mr Elias Buhr (from the farm Grasberg) by the observant farmer Mr W. J. Theron (Fraserburg District) who brought him some plants. Subsequently, Mr Buhr notified the succulent specialist, Mr Laranos, who later, together with Dr. Van Niekerk, visited a farm 40 km northwest of Sutherland and collected the plant in flower. The plant was then described by Mr. Lavranos in the Journal of South African Botany in 1973 (Lavranos 1973). The plant comes closest to A. broomii, in which the rosettes are more dense and the inflorescence is much longer and compact, with the flowers (of which the individual flower stalks are only 2 mm long) partially covered by large imbricate bracts. 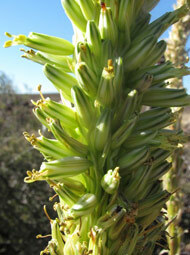 The flower stalks are up to 20 mm long in Aloe chlorantha. The leaf sap of Aloe chlorantha, when damaged, turns yellowish orange. Aloe chlorantha flowers during spring (October to November). According to a local farmer, Steve Theron, the plants are pollinated by solitary bees and other insects. This is unique and appears to be a derived characteristic, as a sturdy scape (flowering stem) is usually a clear adaptation to bird pollination. The plant grows on exposed northern and western slopes, the green leaves becoming purplish during dry periods. It is occasionally planted but not known to be used medicinally. With its small greenish yellow flowers Aloe chlorantha is not as attractive as its close relatives. However, it is still a striking plant which thrives in Karoo and Succulent Karoo gardens, best planted as a feature plant on a rockery. In these regions it is easy to grow and best in full sun. Outside of its habitat (in high rainfall regions) it is best grown in containers in a greenhouse under controlled conditions. Propagation is easy from seed, and it thrives in small containers. Seed germinates within 3 weeks, and plants will flower in the fourth year. Glen, H.F. & Hardy, D.S. 2000. 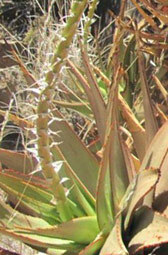 Aloe chlorantha Lavranos in Aloaceae (first part). Flora of southern Africa. Vol. 5, part 1. National Botanical Institute, Pretoria. Carter, S., Lavranos, J.J., Newton, L.E. & Walker C.C. 2011. Aloes, the definitive guide. Kew, London. Lavranos, J.J. 1973. 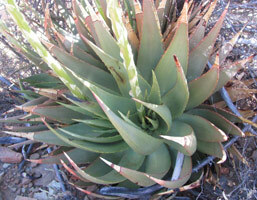 Aloe chlorantha: a new species from the South Western Karoo (South Africa). Journal of South African Botany 39: 85-90. Victor, J.E. 2009. Aloe chlorantha. In D. Raimondo, L. von Staden, W. Foden, J.E. Victor, N.A. Helm, R.C. Turner, D.A.Kamundi & P.A. Manyama (eds) 2009. Red List of South African plants 2009. Strelitzia 25. South African National Biodiversity Insitute, Pretoria.